An inescapable conclusion to be drawn from the literature on the measurement of welfare is that the use of consumer’s surplus is a bad idea. This is especially true in the light of the fact that modern computing power facilitates the straightforward calculation of equivalent variation, the operational welfare indicator that is most strongly justified by economic theory. Consequently, a correct welfare analysis of a price-wealth change of the sort discussed in virtually every cost-benefit text should be principally in terms of Hicksian demand curves, not ordinary (Marshallian) ones. The present paper explains how to construct a graphical depiction of such an analysis, in partial equilibrium, which may be adopted in teaching the principles of cost-benefit analysis to graduate and advanced undergraduate students. This is done by way of several detailed examples covering the scope of applicability of the technique. In addition, a new formula for approximating equivalent variation is developed and analyzed. Armstrong, Keir G. (2004). 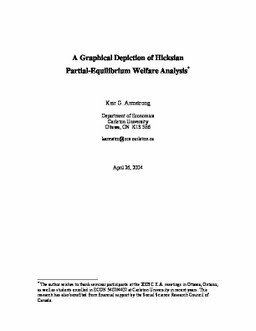 A Graphical Depiction of Hicksian Partial-Equilibrium Welfare Analysis (No. CEP 04-09). Carleton Economic Papers (CEP). Department of Economics.